Driven by demographic and economic forces, the global healthcare market is changing rapidly and dramatically. The middle class in key emerging markets is expanding, while populations in developed markets are growing older and putting increased pressure on healthcare systems. Changing payment models are expanding care beyond hospital settings; industry consolidations are transforming the care continuum; and consumers and patients increasingly demand faster and more personalized services and solutions. 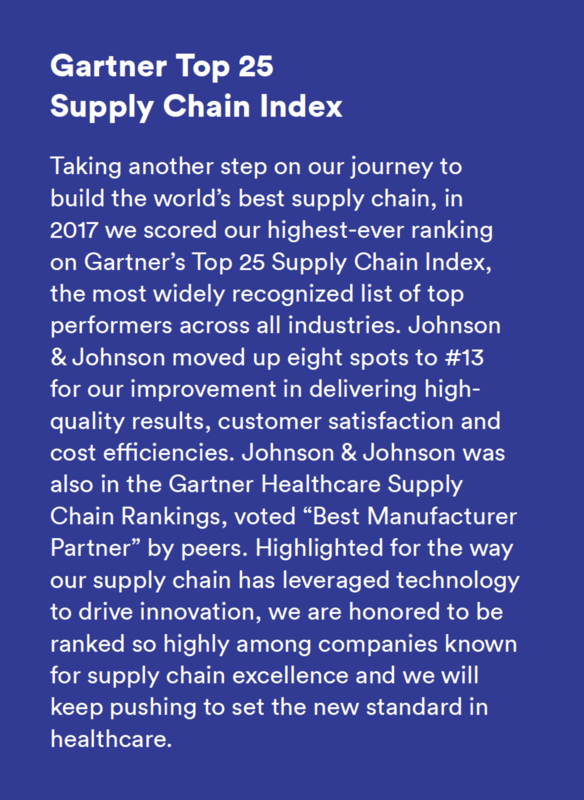 At Johnson & Johnson, we continuously re-evaluate and refine our global supply chain strategy to keep pace with the evolution of the global marketplace. Our goal is to remain a leader and a trusted partner in healthcare by addressing the changing needs of our patients, consumers and customers – whoever they are and wherever they may be. Manufacturing for the Future (MFF) is part of our supply chain strategy and was created to transform our manufacturing processes into a connected, self-learning and hyper-efficient production system of the future. MFF aims to bring us closer to the future state of manufacturing, which we know will be based on an intelligent manufacturing system that is seamlessly integrated into the end-to-end supply chain. Specifically, through MFF we are working to identify and rapidly deploy innovative operational technologies that allow for making our plants and facilities smarter and the supply chain more agile and faster. To digitalize the manufacturing process, we are exploring—and employing—disruptive technologies, such as 3D printing, smart-sensing, robotics, augmented reality, and various big data and analytics tools. Digitalization will not only allow for enhanced process controls, improved line efficiencies and flexibility, but will also expand the skills and capabilities of our people. This in turn will improve our overall operational efficiency, as well as create added environmental sustainability benefits, such as water and energy-use efficiency, operational waste and emissions reductions. Our approach to operationalize new technologies is based on screening, testing and rapid deployment of promising disruptive technologies. This approach is implemented with the help of our advanced technology teams within Johnson & Johnson Supply Chain, who identify and explore new technologies. These technologies are then tested by Test & Learn sprint teams in the different supply chain segments, and if successful, are scaled and deployed across our supply chain where needed. Our three main Test & Learn focus areas are asset performance optimization, integrated quality, and digital/smart factory. In asset performance optimization, we have been working to automate the more mature maintenance management techniques using digital mobile systems. The digital flow allows us ready access to data at the point of use, making our technical staff more efficient in troubleshooting and resolving maintenance issues. For integrated quality, we have been developing capabilities to transform the way we make, test and release products to the marketplace. For example, we are accelerating deployment of technologies that provide real-time product quality data during the actual manufacturing process instead of employing the conventional practice of testing a product in a Quality Control laboratory after it has been manufactured for sale. These technologies allow for continuous digital monitoring of analytical and physical product quality during manufacturing, which saves time, improves production sustainability, and enhances supply reliability. As an example of digital/smart factory solution, our Company was one of the earliest business adopters to pilot the first-of-its-kind wearable augmented reality technology. We equipped our IT global managers with the technology and encouraged them to tap into the technology’s potential to improve quality, productivity and efficiency across our diverse sites and operations. Employees who tested these wearable devices reported improvements and voiced enthusiasm for the technology’s promise. As a next step, we are working to deploy this technology across our global operations.